Does the thought of getting up in front of a room of people to speak make you want to run screaming into the pits of Drachmar? Well, you’re not alone. As a highly experienced public speaker, I thought it would be useful to share seven of my presentation tips for those of you who find yourselves faced with the challenge of speaking live. It doesn’t matter if you’re explaining what a fireman does to a room full of second graders, delivering a quarterly report to the board, or laying down a scathing, profanity-laden UN address. The method is the same. 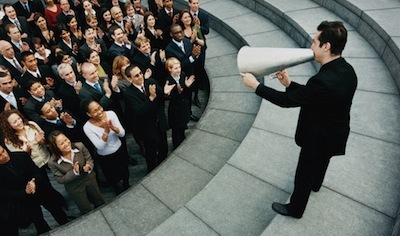 Public speaking hinges on being able to clearly communicate with your audience. 1. Identify the goal of your speech. If you’re really nervous, your goal will be to flee from the stage as fast as possible. You should suppress this urge until the completion of your speech when fleeing the stage is customary. Your true goal, however, should be about what you hope your speech will communicate. So, take the time to figure that out. And, if your audience looks sleepy, your goal should also be to wake them up so they hear what you have to say. 2. Plot a path to your goal. Come up with a small number (less than 40) of key elements that you want to impart. Write each of these concepts on an index card and cluster post-its with key related words and phrases to each card. Next, pin those index cards on a bulletin board. Finally, place this board next to your bed or chamberpot so you see it when you go to sleep and wake up. Your ideas will take hold of the neural pathways in your head. 3. Don’t write out your speech word for word. Your audience will see how many pages you have and get worried about how long they’ll have to listen to you. Better to strip out all the vowels from your words, so your speech appears to be only two pages long. Be sure to show the audience you only have two pages so they get excited about the prospect of a short speech. You are then free to loosely ramble for an hour about the 40 topics you’ve brain clustered to your neural pathways during step two. 4. Don’t try and memorize your speech word for word. Memorizing is difficult. Remember that poem you tried to learn in 8th grade? Neither do I! Second, a recited speech sounds less natural to the audience. Instead, memorize the core elements and then trust your brain to fill in the gaps with a natural flow of words and long guttural sounds. Use your two pages of vowel-less notes (see above) for reference if you get stuck. 5. Practice your speech several times. Remove all your clothes and stand in front of a full length mirror or reflective hotel window. Gaze at your reflection and and begin delivering your speech out loud as if your naked reflection is the audience. The second time through, begin doing some vigorous jumping jacks. When you complete your speech successfully, reward yourself with a short stack of syrupy room service pancakes and then put your clothes back on. Once you complete this prep, you will have nothing to fear when you get in front of your audience. 6. Perform a site visit. If you can, visit the venue ahead of time. Think about the lighting, where your slides will be projected, and make sure you know the location of all exits and load bearing walls. If possible, take your clothes off, and deliver your talk (see #5 above). It will make you feel more comfortable when it comes time to give the speech. 7. Have fun. This is your moment to shine, so be sure to enjoy it. Remember that the spotlight should be on YOU and not on slides, handwritten notes, the oversized bouquet on the stage, or your distracting twitches or mannerisms. Be sure to remember to keep your clothes on, unless you’re presenting at a certified nudist colony. Making a real and meaningful connection with your audience takes a lot of preparation, energy and hard work, but it will pay off with great dividends when you take the time to do it!